BEST Gluten Free Shortbread Cookies! Because this recipe doesn’t contain eggs these gluten free shortbread cookies can easily be made vegan by using dairy free margarine instead of butter and it works perfectly every time! 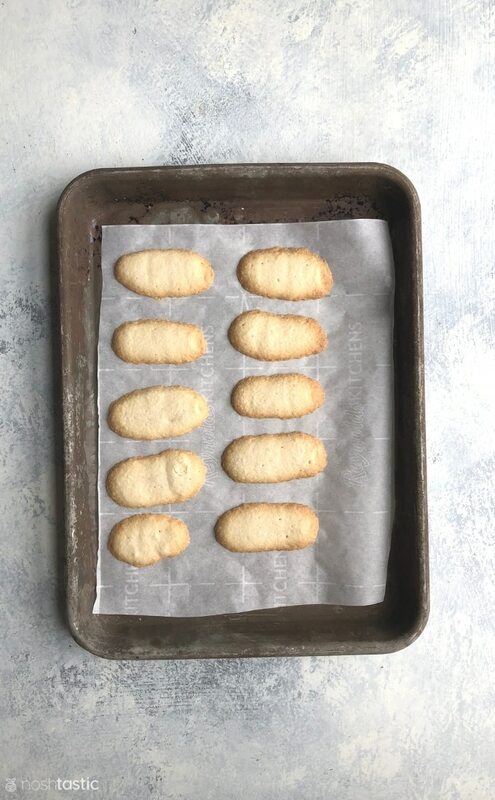 Start by turning on your oven to 350ºF and then prepare a small sheet pan or cookie sheet and line it with parchment so your gluten free shortbread cookies don’t stick to the pan. 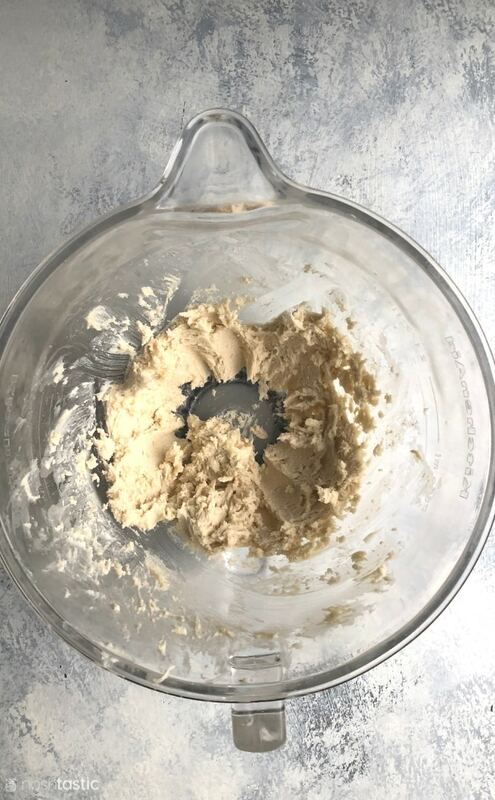 Add your dairy free margarine, or softened butter if you are not making your gluten free shortbread dairy free (amounts are in recipe card at the end of the post) to a mixing bowl, and then add the sifted powdered sugar. Mix the margarine or butter with the powdered sugar really well until combined. If using real butter you must make sure it’s soft so it will mix properly. 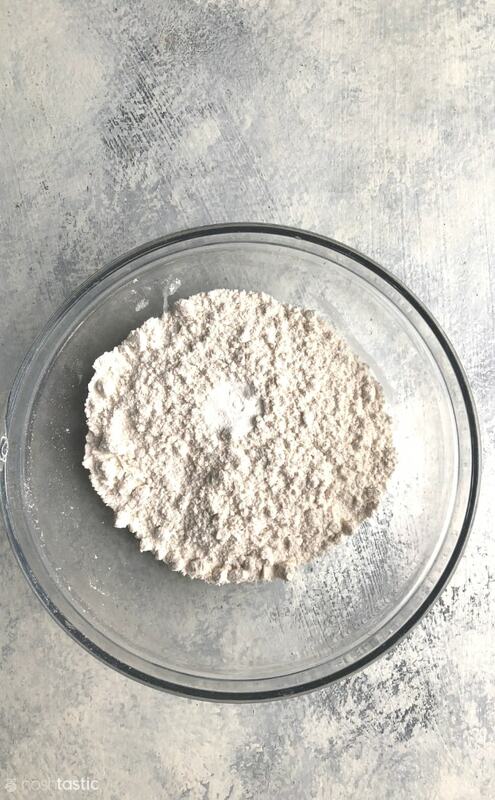 Then, measure out your gluten free flour, plus baking powder, and if your flour blend has no added gums you can add the xanthan gum listed in the recipe. Mix this together with a fork so that the baking powder is evenly mixed throughout. 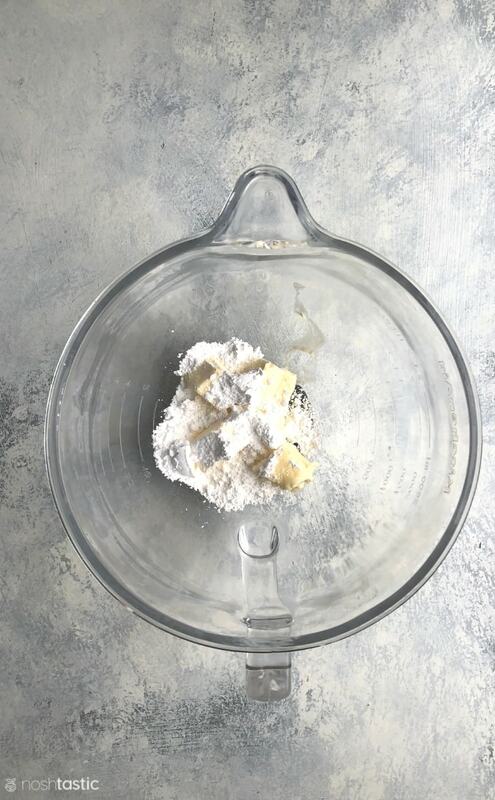 Now add the flour for your gluten free shortbread cookies to the bowl with the already mixed butter and powdered sugar and blend well to create a soft cookie dough. The mixture will be quite soft, this is what you want. If your room is too hot then the butter may melt, you don’t want that! You simply need it to be soft. Add the cookie dough mixture to a piping bag and then squeeze out into small fingers on the parchment lined sheet pan. You can make round cookies too if you prefer, it’s really up to you. Do leave enough room between the cookies as they spread quite a bit on the sheet pan when they are cooking. Bake for about 12 minutes or so, but the exact time will vary based on your oven. Once the gluten free shortbread cookies are baked you can let them cool on the sheet pan. Because they are baked without eggs they are very fragile so just be careful when you pick them up. When they are fully cooled you can dip them in melted chocolate if you like, I think this really make a fantastic addition to the cookies and as it’s really easy to do I wouldn’t skip this step. You can let the chocolate harden by putting the cookies on a cooling rack until the chocolate is hard. How Long will Gluten Free Shortbread Cookies keep? My gluten free shortbread cookies are best eaten the day they are made, remember they are not made with any preservatives or even eggs. You can make the cookie dough ahead of time and keep it in the fridge for a day or two if you need to, although you will need to let it soften a bit at room temperature so that you can pipe it. What’s the best flour for Gluten Free Shortbread Cookies? I always make my own gluten free all purpose flour for baking as it’s cheaper and I get better results than I’ve had with most of the ready mixed flours. 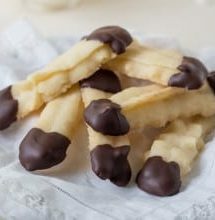 If you need to make my gluten free shortbread cookies with a ready made store bought blend I would avoid using a flour mix that has the gum already added, it’s better to measure it out yourself as the ones with added gums can give a much more sticky results and there’s really no way to determine the ratio of gum to gluten free flour. 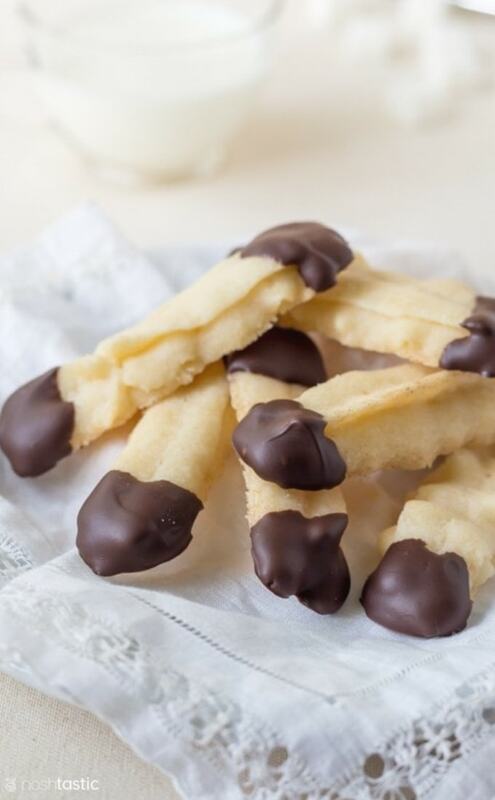 Delicate and tasty gluten free shortbread cookies dipped in chocolate! Please read the recipe notes before you start. 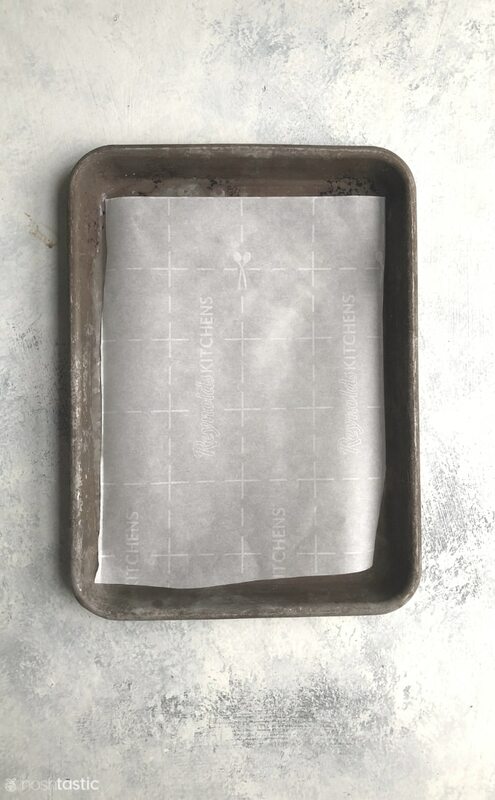 Line a baking sheet with parchment paper, and then add a large star tip (such as a 1M) to your piping bag. 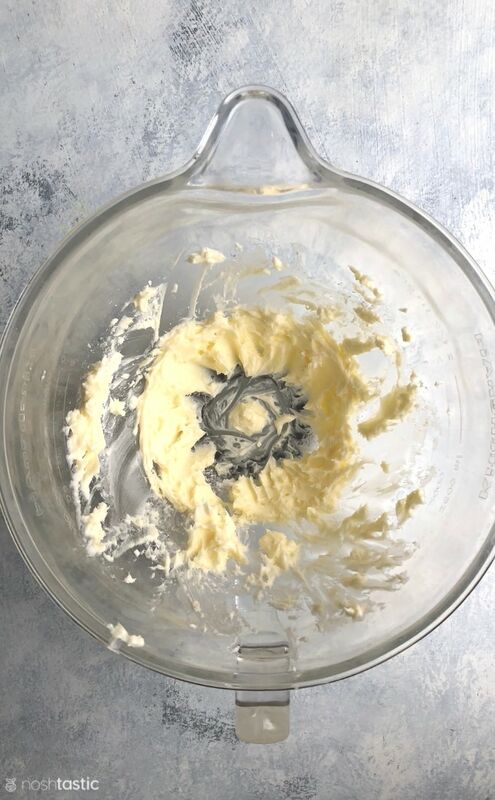 Add the dairy free margarine (or softened butter if you prefer) and powdered sugar to a mixing bowl and beat until fully combined. Add in the all purpose gluten free flour, baking powder and xanthan gum and mix well. 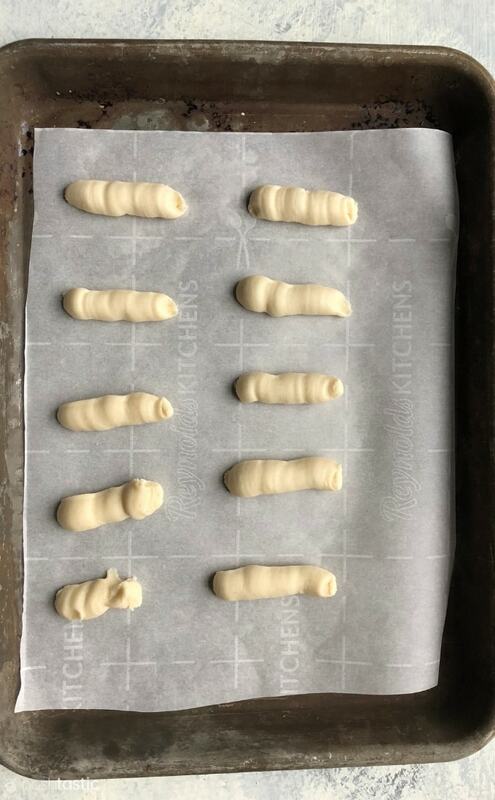 Add the mix to the piping bag and pipe out three inch long cookie fingers onto your lined baking sheet, spaced well apart. Bake for ten to fifteen minutes until a pale golden color. Keep a close watch on them as they can go from cooked to burned in only a minute or two! Let the cookies cool on the cookie sheet for a couple of minutes, then transfer to a wire rack. The cookies are very soft and fragile, so be careful not to break them! Melt your chocolate either in the microwave or in a bowl over a pan of hot water. Dip both ends of the cookie in the melted chocolate and leave to set on the wire rack. You will need a baking sheet, and a piping bag with a large star tip. I used a Wilton 1M tip. I bake by weight as I find that gives the most consistent results, especially when baking gluten free. One cup of your gluten free flour blend may not weigh the same as my blend regardless of how you scoop it. All the commercially available blends have different mixes and ratios of flour in them. I’ve weighed cups of different blends of flour and noted that a cup of gluten free flour can vary in weight from 125g up to as much as 170g depending on how you scoop it, and what type of mix you use. You can see how this could drastically alter the outcome of a recipe. I love arrowroot cookies – I grew up eating them in the Philippines. 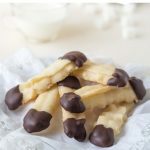 I love that you dipped them in chocolate too – it adds extra yum! Pinned, too. The arrowroot gives a really nice texture I think, it’s a really great gluten free flour to cook with. How do you know which flours to use to make an all purpose gluten free baking flour? Oh my goodness! And they’re vegan <3 These sound lovely!!! These are so cute and such lovely treats to snack on. I love that you give such detailed descriptions. I feel confident that I could duplicate this recipe successfully. Your gluten free tips are so helpful– now I know weighing with a scale is key to getting consistent good results. Thanks. Thanks Dana, baking by weight is easier in the long run, but I’m so used to it as it’s the way I’ve always done it. Thanks Mary, they are very yummy! Great baking tips in your “notes” section, and the recipe looks scrumptious! Can’t wait to try it! Thanks Jules, I grew up baking by weight but I know it’s not what everyone is used to! Well since I am a strong believer that chocolate makes everything better, I think dipping these cookies is sheer genius. Can’t wait to bite into them! Thanks Elle, the chocolate really finishes them off nicely. These cookies look perfectly lovely! These would be absolutely perfect with a cup of coffee in the mornings! My husband loves gluten free shortbread cookies! He will eat them by the handful! Sabrina, They are way too easy handfuls to eat in one sitting, I know from experience! These look delicious! I am pinning to my allergy free treats board. Thanks Tricia! my son is bugging me to make some more today, they were very popular! Nice to meet you over at Food Bloggers Central. Loving the look of these cookies. If only I could reach in and grab one! These are so adorable! Perfect coffee dippers – and look so simple to make, too. Just lovely! Thanks Steph, they were so simple to make as they only have a few ingredients. Thanks so much Nicole, I’m rather pleased with the way the photograph turned out in the end! Hi Jean! Nice to meet a fellow Highlander 🙂 My parents live in Inverness now, we were there in the summer of 2014 and had a really lovely time. Hi there! I whipped up a batch of these earlier. I used the 1m tip, and also piped some biscuits in the shape of roses. I liked the biscuits, but without the chocolate they would be extremely plain. Next time I’d like to try adding some zest and other flavours to them. Thanks for the recipe! Hi Nell, glad you enjoyed them! 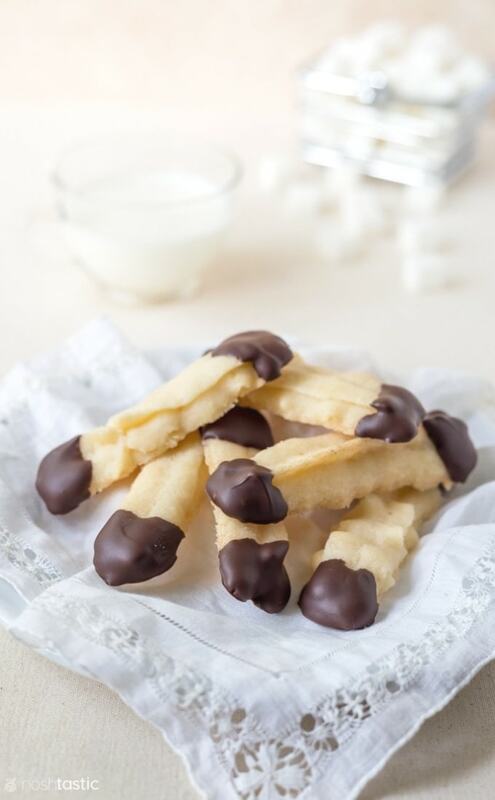 Yum, chocolate and shortbread – the perfect gluten free shortbread cookie combo! what dairy free margarine/butter do you use? I have not been able to find any for my daughter so we always use coconut oil. Earth Balance is the only US margarine I’ve found that is suitable for baking, there may be others but I’m not aware of them. I know that Smart Balance (I think…) also has one dairy free variety, but it’s a low calorie type of thing and I doubt it would work for baking as the water content is probably too high. If you live out in a small town it may be hard to find, where we lived previously the Walmart and Kroger did not carry it for a long time, I had to travel to a larger town to stock up. It keeps for a long time so I would buy plenty if you find it. these cookies look so delicious I’m going to have to try them! We made your gluten free shortbread cookies this morning, amazing shortbread and the texture was perfect. We did use a pre blended flour mix and they turned out ok for us. Thanks Anna, I’m so glad you loved the cookies. These are the most incredible gluten free cookies I have ever eaten. Thank you so much Sheena. I will definitely be making these again. Nobody even knew they were gluten free. I used real butter because I am not dairy free, and I used King Arthur’s gluten free all purpose flour and omitted the xantham gum. I didn’t use the piping bag. I just rolled them into logs, which did flatten during baking, but they were fine. I drizzled chocolate across the top of them when cooled. Absolute heaven! I am looking forward to making more of your recipes. I’m so pleased you loved the cookies Lorraine, that’s great! I don’t think that will work with the measurements I have as this is a gluten free recipe.